I'm back from my sojourn in Southern Italy. Oh the places I've gone and the things I've seen. I spent a fair amount of time combing through 1st Century Roman ruins in Stabia, Herculaneum and Pompeii. Although I didn't do any actual work while I was gone, I did take a lot of notes that will play heavily into my designs from this point on. 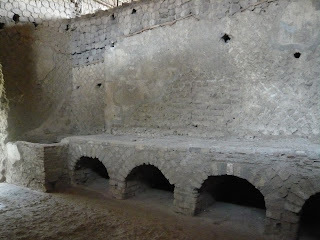 Below is a photo of the kitchen in the Villa San Marco. The Villa San Marco was the home of a wealthy Roman family and it was destroyed by the eruption of Mount Vesuvius in 79 AD. At the time of its destruction, the villa is thought to have been 150 years old and there is ample evidence of its periodic renovations over those 150 years. Walking through it is mind bending, let me tell you. Be warned though, the next person who asks me about a "Mediterranean" kitchen is going to end up with something that looks like this. Hah!